Last week, the Jobs, Economy and Small Business Committee held a hearing in Hurley to listen to public testimony on AB426, the new mining bill being introduced into the Assembly on January 26th. Truly one of the worst pieces of legislation to come down the Republican pike yet, from the start this bill has been a disastrous display of the power of corporate hitmen ALEC—the American Legislative Exchange Council. This neo-conservative factory crafts legislation for all sectors of governance in order that the greatest benefits and lowest risks are afforded to the corporate sponsors. As reported earlier, all but one of the Republicans on the Jobs Committee are ALEC members. 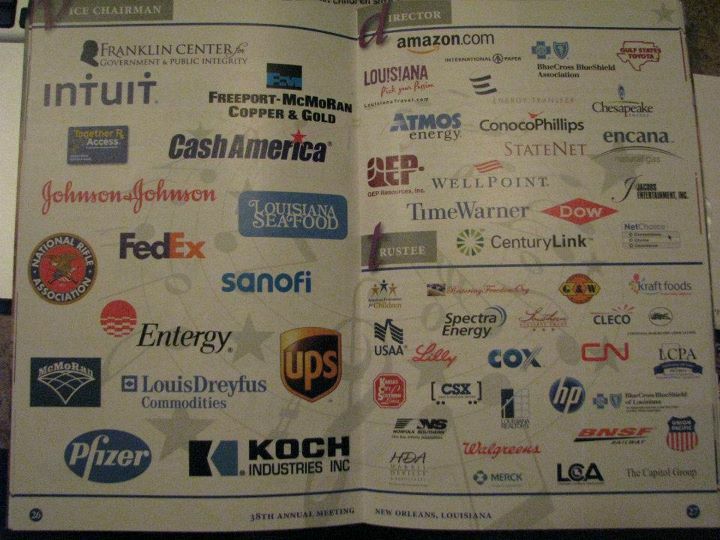 Their decision to participate in ALEC means that instead of honoring their oath of office to protect us and the constitution, they have demonstrated their allegiance instead to Koch Industries, Fedex, Walmart, Walgreens, UPS, and hundreds of other corporations that pay to have a place at the ALEC table. 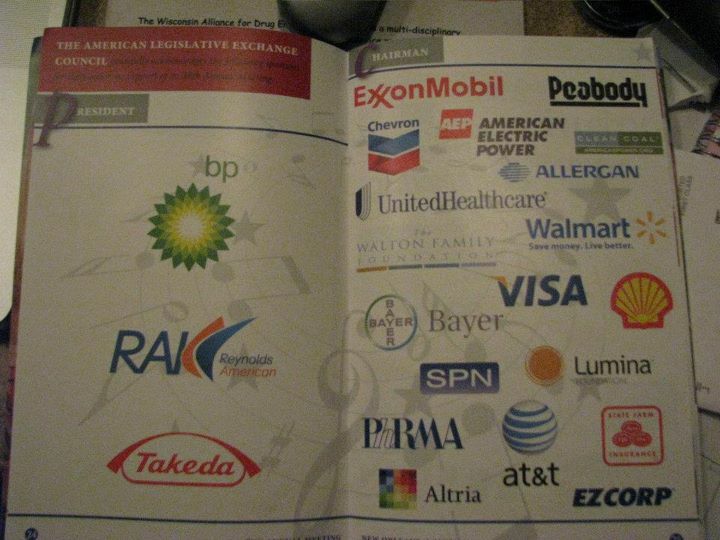 For the past year, Wisconsin has watched, helpless, as this band of traitors has used their majority power to lock-step-extortion-vote into law any and every ALEC piece of legislation they could get their hands on. The reason? One might be led to believe that these corporations are collectively instigating the hostile takeover of our government. Wisconsin ALEC groupies, however, particularly the members of the Jobs committee, deserted the state constitution and their posts even further to swear allegiance to ALEC Rep. Jeff Fitzgerald (R-39), the younger, smaller third of the “Fitz’ of Fitzwalkerstan”: Brother Scott (R-13) runs the Senate, while Papa Fitz oversees the state patrol. Gangsta Jeff runs a very tight ship in the Assembly. According to The Progressive, Jeff claims that all the 2010 freshmen Republicans Representatives are there to do his bidding. 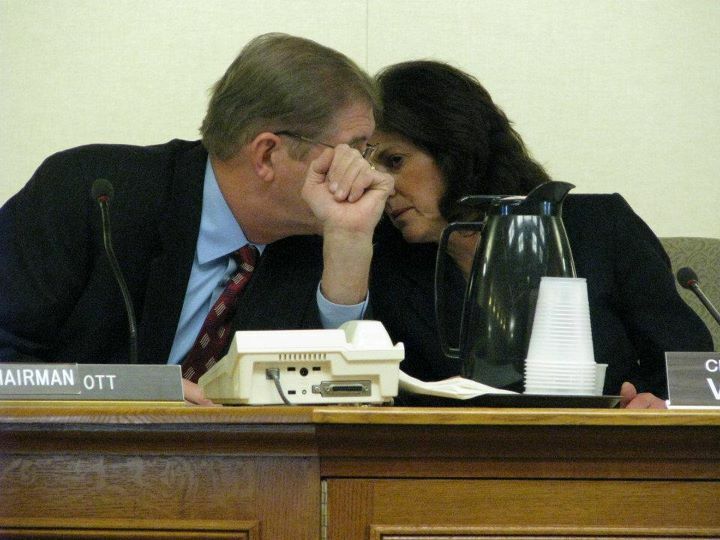 Fitzgerald boasted during a floor session several weeks ago that each of the 27 vowed to be one-term legislators who are in the assembly to “get the job done for me” and to not be concerned about reelection. In other words, they are more accountable to Republican leadership than they are to the will of their constituents, reported the online news source last August. 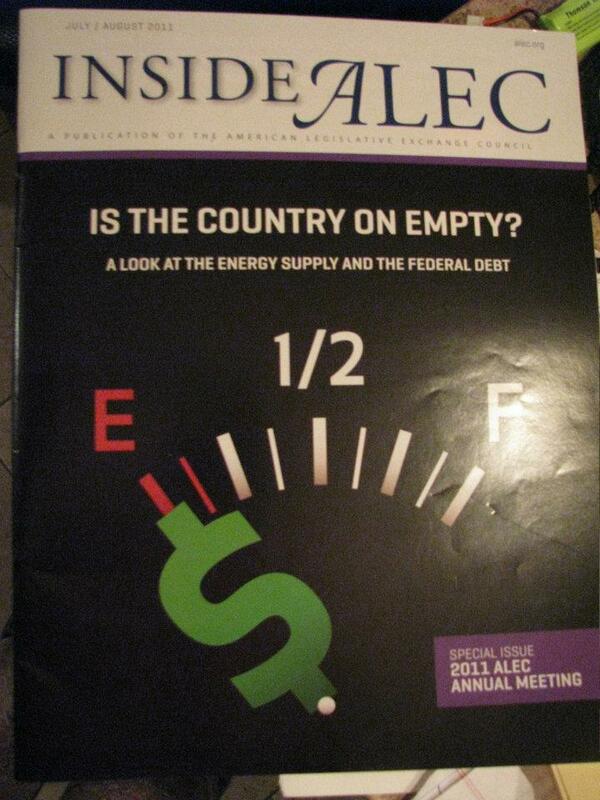 Now we know that Republican leadership is more accountable to ALEC than We the People. 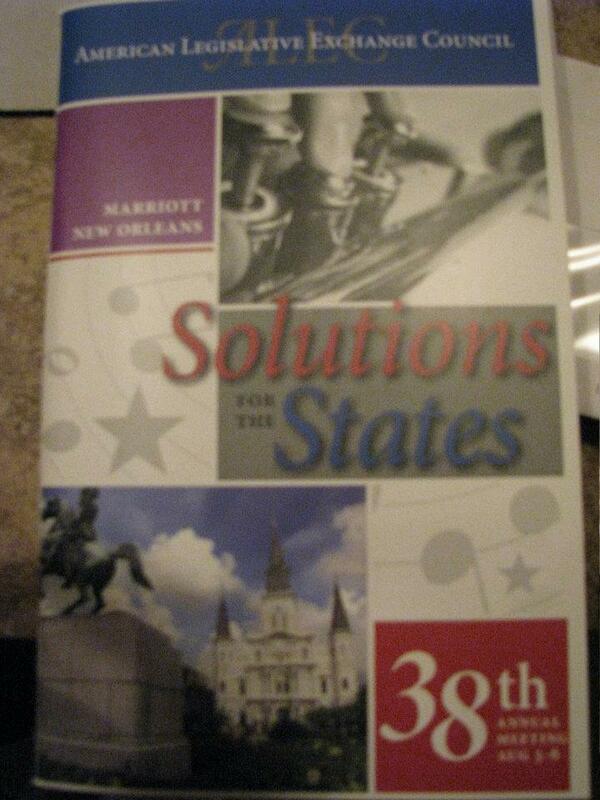 ALEC Republicans serve on committees that help craft the legislation. Jobs Committee member Rep. Amy Loudenbeck (R), for example, moonlights as the alternative for the ALEC Commerce, Insurance and Economic Development Task Force. Using her private sector expertise, Loudenbeck no doubt provides valuable input on how to craft the bills to be of the biggest benefit to the corporations that dominate those industries. But practically, how do they do it? For months we have documented as Democrats in both the Senate and the Assembly have filibustered, debated, cajoled, shamed, begged and demanded that the Republicans participate in Democracy to no avail. Ask any Democrat, Native American, or all those union thugs singing inside the capitol coming up on a year now, Republicans do not take into account anyone but their lawyers and the Republican National Committee in the decisions they are making in behalf of our State. Republican MO is to retreat into closed caucus where they use their majority status to control which bills to pull out of committee. No amendments, no discussion, no debate. Back on the floor, when the Democrats begin the debate, an essential part of the democratic process, Republicans sit silent. My guess is both Fitz’ actually demand they don’t speak. Since they aren’t paid to think but instead to throw the switch the right way when it comes time to vote, no actual critical thinking is required. On the floor or in committee, they laugh and talk amongst themselves, text, or work on their computer, or come and go out of the back rooms. From what I can see, there are only four reasons they ever speak: 1) it’s required by procedure 2) someone says something that pisses them off and their egos get the best of them 3) they’re bored or 4) the debate has turned to the truth, and they need to divert attention away from their crimes of treason. Below is the first of two video examples of these distractive tactics you’ll never hear about on nightly news. But under the authority of Jeff Fitzgerald, Republicans have been taught to distract in this way when the debate gets too close to calling them out of their hidey holes. 1. Sen. Vukmir, Co-chair, Joint Committee for Review of Administrative Rules and ALEC Health and Human Services Task Force co-chair, reversing the Government Accountability Board’s ruling that technical college ID are a valid form of voter ID. That the GAB was actually functioning as an independent entity outraged the Republicans. A special meeting of the Administrative Rules committee was called to take them to task. Co-chair Vukmir wanted to send the ruling through Governor Walker’s new Office of Regulatory Compliance created early that month to pre-screen all proposed administrative rules such as this, which he gave himself the power to veto. “We gave them the benefit of the doubt…but it’s clear that they had their intentions set and they chose to ignore the very clear direction the committee gave them,” said Vukmir. Democratic members Kessler, Risser, Hebl and Taylor debated the need to rule out tech colleges, thereby disenfranchising 400,000 voters. In this clip Sen. Lena Taylor succinctly and respectfully summarizes the democratic process that the ruling had been put through and the logic behind the GAB’s decision, clearly warning Vukmir that if she sends it to Governor to veto, she will essentially be abusing her power, undermining the process, and stripping the GAB of any legitimacy it has as an independent governing body. So how does Vukmir respond? By reminding Taylor that she is in charge, and reprimanding her for the disrespect Taylor is showing the committee. In the end, the decision is made to send the decision on the the governor’s office to rule on, which could take months, or to veto, which could take no time at all. Rep. Kessler asks Leg Council if there is a definition of “technical college.” As you watch, remind yourself that our tax dollars are paying for this.